Why get your windows tinted? We can get up to 99% UV protection in your car, which will make the interior last longer and increase the value of your car. If your window breaks, the film prevents glass from falling in. Now what’s the catch here? Well, it’s not as simple as just going to any old place and asking for a tint job. 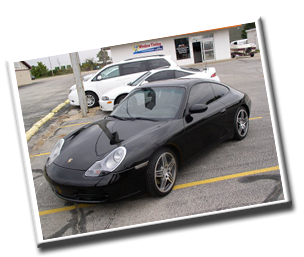 Besides Indiana’s regulations (which you can find out more about in our FAQ), tinting isn’t an easy job. A lot can go wrong, like getting dirt, creases, bubbles or moisture in the film or incorrect installation that won’t last. So, do yourself a favor and go to a specialist – we happen to have one on hand! Our window tinter has over 20 years experience tinting glass. Your windows are in talented, safe hands with him. For a professional job, accept nothing less. And if you’re not sure exactly what you want, stop by and have a chat; we can help you decide.